Sleep that occurs during the day is often viewed as being a mark of laziness. Sleeping on the job is not viewed as a trait of the successful, driven employee. On many occasions, patients have admitted to me that they "sneak" naps during the day. There is a secret club in this country. Its members are taking part in activities that most consider taboo. Like Fight Club, the cult movie classic based upon Chuck Palahniuk's novel, members meet to engage in a human behavior more basic and primitive than fighting. This is Nap Club, and the first rule of Nap Club is you do not talk about Nap Club. So why aren't we all napping? In much the same way society frowns upon grown men meeting in parking garages and beating each other up, society is equally dismissive of napping. Sleep that occurs during the day is often viewed as being a mark of laziness. Sleeping on the job is not viewed as a trait of the successful, driven employee. On many occasions, patients have admitted to me that they "sneak" naps during the day. By far and away, the 'Parking Lot Car Snooze' is the most popular. In this scenario, the patient quickly inhales their lunch on their way out to their car. Once the seat is back, and the cell phone alarm is set, the sleeper is ready to squeeze as much sleep into their break as they can before they have to be back in the office. Not every napper feels it necessary to leave the office, though. Just like George Costanza demonstrated when he devised a nap haven under his desk, many individuals hide out in their office and sleep. One patient who teaches school had a nap lair so elaborately designed that detection was virtually impossible (I would publish details, but I promised not to for fear that it would compromise his defenses). Is napping ever going to lose this stigma and be embraced by the masses? That depends on who you ask. In many European countries, afternoon napping or siestas are viewed as commonplace. Much to the dismay of foreign travelers, life often shuts down in the afternoon as widespread rest and napping occurs. In colleges throughout the United States, napping is a regular occurrence. Sleeping students are as common as awake students in campus libraries, and the design of much of the furniture in these libraries suggests that the behavior, if not being encouraged, is at least being supported. At my alma mater, the University of Virginia, architecture students elevated the daytime nap to a level of artistic brilliance with intricate sleeping lofts being constructed over their drafting tables within the school. Newer bastions of nap acceptance are often well-documented in the media when Google or Zappos opens up their headquarters and the media is allowed to see the elaborate nap rooms set up for their employees to utilize between periods of work and riding scooters around the office. These forward-thinking companies have seen the power of napping when it comes to productivity and employee feelings of well-being. The problem is, how do people create a society of napping acceptance if they don't happen to work for Nike? I think I have seen the answer. It revealed itself to me one morning when I turned on my office computer. There, on the screen, was a pillow. This was no ordinary pillow. This was a pillow specifically designed for napping that was unlike anything I have ever seen. The pillow is worn on the head, blocking the light and thus creating a perfect nap environment no matter where the wearer finds himself: in a library, in an airport... anywhere. This was not what got my attention. What captured my imagination was the fact that the wearer of the so called "Ostrich Pillow" looked like a freshly-picked scallion. To say that the sleeper looks like an ostrich is a disservice to ostriches. To put it bluntly, the wearer could easily walk into that Star Wars cantina, be served without any controversy, and probably get a job with the house band on the spot. 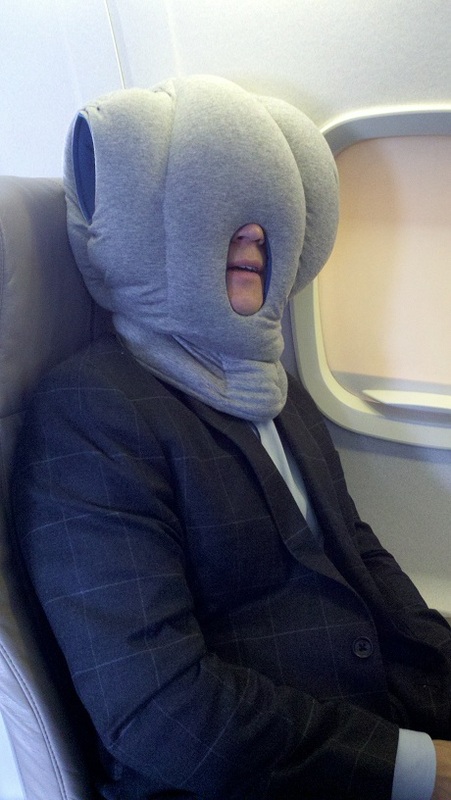 And this is precisely why the Ostrich Pillow may lead the napping revolution in this country. Not because it works (it does) and not because it is extremely comfortable (it is), but because it makes an incredibly bold statement. The wearer is no longer ashamed of napping... the wearer is loudly declaring that not only is napping a good thing, but he's not going to hide the fact that he's doing it. This napper is going to don this huge head wrap, put his head down on the Starbucks table, and sleep a glorious sleep... unabashedly proud that he is doing something positive for his body. So obviously, as both a sleep doctor and someone who travels frequently, I had to have a pillow for myself. After some amateur Internet investigation, I tracked down Kawamura-Ganjavian/Studio Banana THiNGS, the makers of the symbol of napping freedom that I envisioned the oppressed and sleepy masses would raise like a flag as they charged into this new American Renaissance. (Note: Be careful charging anywhere wearing this thing, as it is impossible to see when you are wearing it.) I excitedly called to request my pillow only to find that not only was I calling Spain, but that the studio was currently closed -- most likely to take a nap. Figures. Caption: Leading the charge on United flight 5999 to Tulsa. 1. Milner CE, Cote KA. Benefits of napping in healthy adults: impact of nap length, time of day, age, and experience with napping. J Sleep Res. 2009 Jun;18(2):272-81. 2. Härmä M, Knauth P, Ilmarinen J. Daytime napping and its effects on alertness and short-term memory performance in shift workers. Int Arch Occup Environ Health. 1989;61(5):341-5. 4. Peth J, Regen F, Bajbouj M, Heuser I, Anghelescu I, Hornung OP. The influence of daytime napping versus controlled activity on the subjective well-being of patients with major depression. Psychiatry Res. 2012 Jul 10.